The paper "Learning Analytics: Challenges and Future Research Directions" has been published in the e-learning and education journal (eleed). In recent years, learning analytics (LA) has attracted a great deal of attention in technology-enhanced learning (TEL) research as practitioners, institutions, and researchers are increasingly seeing the potential that LA has to shape the future TEL landscape. Generally, LA deals with the development of methods that harness educational data sets to support the learning process. This paper provides a foundation for future research in LA. It provides a systematic overview on this emerging field and its key concepts through a reference model for LA based on four dimensions, namely data, environments, context (what? ), stakeholders (who? ), objectives (why? ), and methods (how?). It further identifies various challenges and research opportunities in the area of LA in relation to each dimension. Chatti, M. A., Lukarov, V., Thüs, H., Muslim, A., Yousef, A. M. F., Wahid, U., Greven, C., Chakrabarti, A., Schroeder, U. (2014). 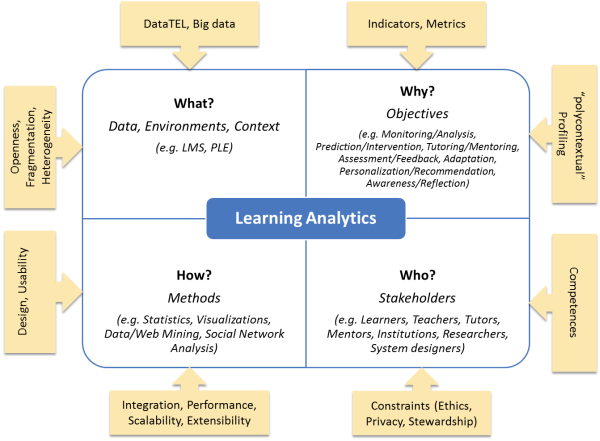 Learning Analytics: Challenges and Future Research Directions. eleed, Iss. 10.